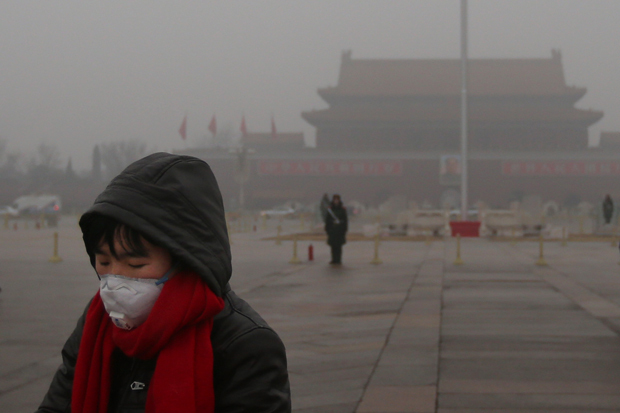 A woman wears a mask walks in Tiananmen Square during a day of severe air pollution in Beijing, January 31, 2013. By Jan McGirk, a former correspondent for The Independent, who has reported on environmental issues and disasters in Asia, Latin America and the Middle East. This review was first published by chinadialogue. The name of China is almost obscured by a grey smudge on the title page of The People’s Republic of Chemicals, and this image proves to be apt. This book examines the crisis caused by toxic smogs that periodically choke vast regions of China and the massive particulate clouds that drift far beyond the country’s borders. Authors William J. Kelly and Chip Jacobs joined forces once before in order to write their climate classic, Smogtown: the Lung Burning History of Pollution in Los Angeles, a remarkable 2008 exposé and memoir about air quality, politics and health in Southern California’s smog belt. This time, the duo of self-described “smog gumshoes from Los Angeles” go farther afield to investigate air pollution that threatens to put a chokehold on the Pacific Rim. What’s more, Mandarin editions of both books will be available through the Central Party School Publishing House. No doubt the translators were challenged to render some of the exaggerated gonzo phrases and slang from this “murky yarn of atmospheric pain and karma” into prose that doesn’t come across as glib or simply baffling. Hypercharged patter aside, the writers do know their stuff. Kelly and Jacobs delve behind the headlines and grim statistics of coal emissions and cancer village mortality to focus on the latest struggles to prevent thousands of needless deaths per day from China’s poisoned environment. The authors insist that this dismayingly high death toll of 1.2 million premature deaths per year—caused by cardiovascular disease, respiratory ailments and virulent cancers of the liver, bone, lung, breast, and blood—could have been avoided. They argue that these deaths should be counted as casualties of China’s overly rapid economic revival. And the multinational corporations who have outsourced manufacturing jobs on such a vast scale must be considered complicit. After some 300 million Chinese people moved out of poverty, the rising middle class now demands a better quality of life. Or at least better air to breathe. Sustainable or renewable alternatives are the way of the future, and China is set to lead much of the research and development. Solutions won’t come easily. Although Beijing recently announced a ban on all coal use in the capital by 2020, China’s existing coal plants are due to spew out carbon pollution elsewhere for decades to come. Because government plans for reducing air pollution may not yield the desired effect, they have grave implications for the rest of the world. Relocating coal plants inland coal gasification plants have been green lighted in order to transform abundant Chinese coal into cleaner-burning synthetic gas or liquid fuels. But syngas has nearly double the carbon footprint of coal and the process is water-intensive. In western China, where many of these megaplants are due to be built, water shortages already are a serious problem. 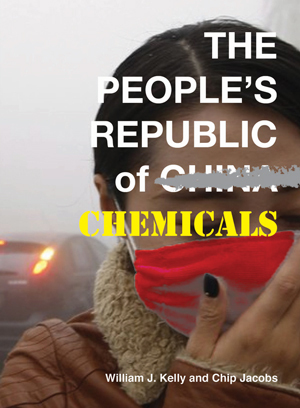 Cover of <em>The People's Republic of Chemicals</em>, published November 2014. Kelly and Jacobs had figured that Southern California’s air pollution solutions could be very relevant to present-day China. Like Beijing in 2008, Los Angeles had been highly motivated to clean up its notoriously filthy air for the 1984 Summer Olympics. The technology of understanding air pollution had advanced and some pitfalls might be avoided. The authors advocate the cooperation of scientists to understand the chemistry of pollution, coupled with regulating very powerful and polluting industries, whether local or multinational. A travel grant from the Society of Environmental Journalists funded Kelly’s first-hand research in China, which ranged from Qufu, Anhui, and Jiangsu to Shanxi province and included a stay in Beijing. Drolly referred to as “Greyjing,” the Chinese megalopolis triggers flashbacks to the 1960s Southern California smogscape of the authors’ childhoods: “the dreariness, the silent casualties, the incessant blame mongering, the madness of a sunless existence.” A former spokesperson for California’s South Coast air quality management district, Kelly is more familiar with the alphabet soup of environmental regulatory agencies than most journalists. He breaks down the acronyms and the anodyne bureaucratese to raise concerns and uncovers the misuse of statistics meant to confuse the public. Chip Jacobs, an investigative reporter with a similar penchant for vivid imagery, highlights quirky personalities and hidden motives in the unfolding saga of climate change. Politics loom large. The book is simultaneously entertaining and alarming, and doesn’t spare officials from criticism. U.S. President Bill Clinton also emerges as an eco-villain. Although Clinton championed environmentalism in the United States, Kelly and Jacobs note how the bilateral trade deals made during his administration got the American consumers hooked on inexpensive Chinese goods. Prices were kept abnormally low because of China’s cheap but dirty energy sources and sweatshop wages paid to labourers. But exporting dirty manufacturing to China could not outsource pollution indefinitely, particularly when antiquated or wasteful methods were used there without modern filters. Regrettably, no provisions prevented China from financing highly contaminating coal-based projects.